I’m not really a diamonds kind of girl, which you may by now have figured out. What I love most is when someone says “I thought of you when I saw this and had to get it for you.” Whatever sparked a fond thought or familiar memory for that person, means more to me than any diamond in the world. And when it’s a surprise, on a random Monday, it’s even better. 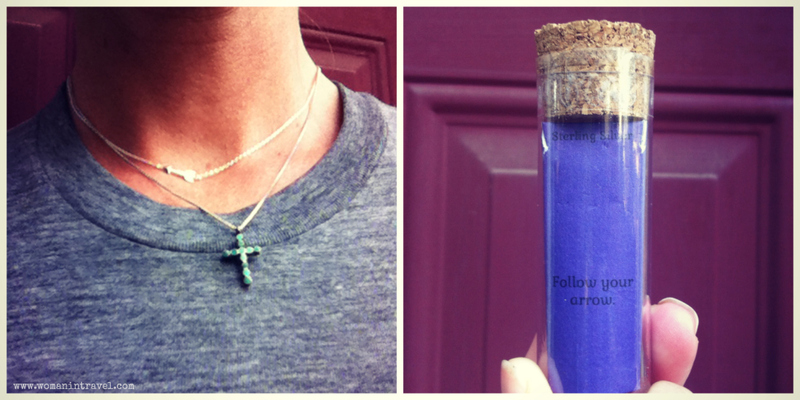 My dear friend, knowing my struggles, brought into the classroom a small vile that contained an arrow on a necklace. (Look how cute that packaging is??!!) On the vile it reads “Follow Your Arrow.” I need that right now, and when she saw it, she thought of me and knew that. There’s nothing sweeter than that. I’m not taking this baby off. When I put my daughter to bed, I reminded her that tonight, October 13th, 10 years ago, is when I went into labor with her, my first born. I had no idea how my life was about to change. How nothing would be the same. My life forever would be so much better because of her. And then as I spoke the words October 13th, I was reminded this was also the date that I was to be married the first time. And then 13 years ago it was the date that I fell off a cliff and broke my back. Both of those events, although dramatic, had to happen for me to have the best October 13th, 2004, when I was to meet my baby girl. I followed my arrow. I didn’t always know where that arrow was going, but I’m thankful for it. This week my first born enters the double digits. If you can remember, this is a very big deal for a nine year old. So the weekend was full of party merriment. Now that she is ten, we didn’t do a full-on backyard party, but rather picked two friends, and I orchestrated a treasure hunt around our town. Without bragging, I can say it was a success. (Phew!) I really didn’t know how it would turn out. But thankfully for the kindness of strangers it did, because as the girls went place to place, they would receive an envelope with the next clue. From servers at Pieology to cashiers at the local boutique, everyone was game to add to the mystique of how things evolved throughout the night. The girls kept begging me to tell them how it was done, how each person already had the envelope. Fortunately for me, 10-year-olds talk a lot and become consumed with each other, so every time they weren’t looking, I was able to slip another envelope to someone else. The joys of parenting-appearing a lot smarter than what I really am! So in honor of my sweet, sweet 10-year-old, I am writing on the bottle cap jewelry she made for her friends to be included in the treasure hunt. My girl has a big heart and is always creating things for other people. 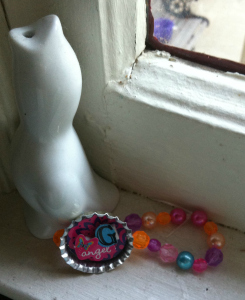 These bracelets probably came from a pre made box gift of crafts, but she always adds her own design to things so it will truly be original. Because this girl, she IS an original. 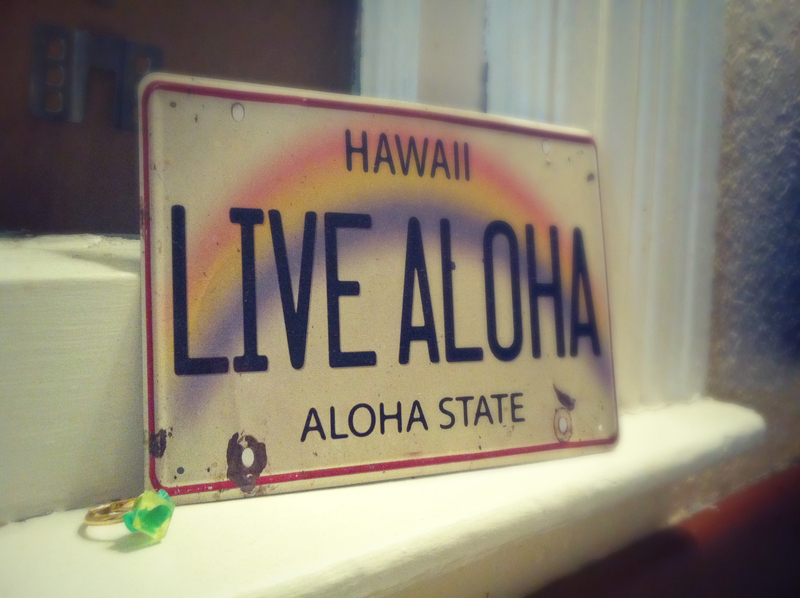 Today I am in a Hawaiian state of mind. Sometimes when life gets just a little too unbearable, I find myself in Hawaii again (if only in my mind), on the beach, in the water, happy. Is it just me or is there some heavy stuff going down lately? I can’t send a text, read an email, or run into a friend at Trader Joe’s without someone telling me of heartache and grief. Life can be hard. It can be heavy. I think that’s why we have happy places like Hawaii. To remind us that there is joy, there is beauty, even in the muck. Sometimes a piece of jewelry can recall beautiful memories. The ring in the photo is made of sea glass. I think I could write a book on 101 ways to use sea glass. It’s one of my favorite materials to work with. Here it is simply glued one on top of another and then centered on a cheap gold band. It’s not perfect, but it is a lovely reminder of the ocean, of more pleasant times, of a promise. I tried to do some work with my pretty turquoise beads. I know they will make a great yoga bracelet, but I just haven’t figured out how yet. I didn’t want to spend the $7 on bead wire last night at Hancock’s, thinking I could use some leftover frame wire. I knew it wouldn’t be very malleable but I thought it could make it interesting. Unfortunately, even though the beads fit on the wire, they didn’t string well and I abandoned the project. So, if you at first you don’t succeed, don’t force it, just try again. I’m not the only one around here thinking of making new accessories. Tonight my son thrusted his wrist in my face when I went to pick him up at Cadet’s. 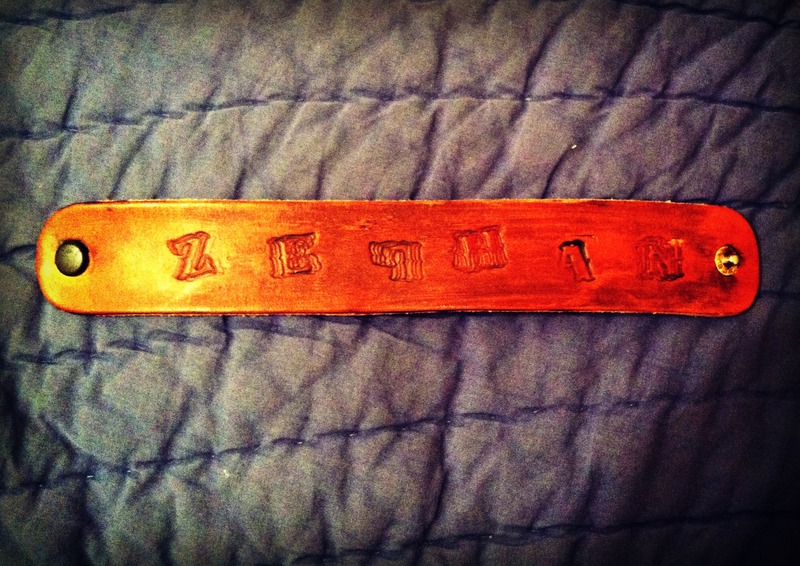 He had “made” himself a leather cuff and stamped his name to make it his own. Cadets is similar to a Boy’s Scout meeting at our local church, except Godly principles are enthused throughout all they do. I so believe in the importance of good men in my son’s life. His dad works shift hours and often misses games or activities, much to his chagrin. But when good men step up and fill in as basketball coaches, and Cadet leaders, and band teachers, my boy gets more adults to look up to and try to emulate. 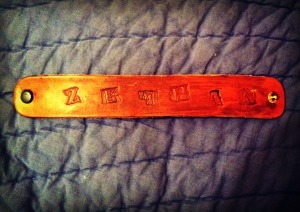 So this simple leather cuff, with a flipped “p” holds a memory for him that I could never have provided him. We are now a week in this 31 days of writing challenge and I am feeling like I do when I’m a week in on one of those awful juice cleanses. I know it’s good for me, but I’m ready to jump ship. It’s not that I’m not enjoying this, but life gets in the way and my creativity seems to go kaput. So I’m pulling one of my projects off the shelf that has been sitting and just needed a little love. This leather cuff began as one of those ankle weight cuffs that people use to exercise with. I picked it up for 25 cents at a yard sale. I slit the backside and a thousand tiny little beads fell out onto the ground (beads that I am still vacuuming up six months later). But the cuff was too bulky and masculine. So tonight I cut off the inside layer of leather. (This took using my husband’s super sharp hunting knife and I am always like one inch from being rushed to the ER because the blade is so dang sharp). I then had to cut off the excess strap and make a new hole for the clasp to be tighter. It is a loose cuff around the wrist or a tighter one in the crook of my elbow. I’m trying to start a new trend. I am hoping to get a new tattoo on my arm there, but will need to cover it for work, so I’m bringing the “upper cuff” to the fashion world. A few years back, my neighbor (in an act of purging her antiques she collected with her ex), gave me some great pieces of Americana. I have an industrial early 1900s coffee grinder, cotton spools, and crystal door handles. I’m ashamed to admit that I passed on a large mason jar of vintage buttons due to the fact I didn’t know what I would do with them. What?? Now I can think of a million things to do with them, but alas, it wasn’t meant to be. But what I did take, not knowing at the time what they would turn in to, was keys! Lots and lots of metal keys. From skeleton keys to hotel keys to who-knows-what-to keys. I’ve strung them as garland, clumped them next to my Halloween decor, and now I wear them. I got the idea from The Giving Keys, and amazing company that gives jobs and gives back to homeless. Vintage keys are stamped with inspirational words by employees who are or have been homeless. It’s a beautiful idea and I have already bought some gift cards from The Giving Keys as gifts so my friends can support such a great cause. So I strung one of my favorite keys on a chain and added a lapis pendant my mom bought for me in some fabulous foreign country to kick it up. When someone comments on it (and someone always does), I always tell them about The Giving Keys. Note: I apologize for the quality of my photos for this challenge. Photography is usually how I express myself even more than words, but as life happens, I don’t start “working” on my blog until about 10pm when the rest of the house is tucked in. Due to that fact, my photos aren’t especially to my liking but hopefully you get the point. I’m cheating a little. Since it’s the weekend, and as I have mentioned repeatedly that I have gone back to work on “the outside,” my weekends are a combination of family time, cleaning the house, the Y Basketball league, and any sort of organizing I need to get my next week in check. With that said, I am combining days 4 & 5. I am also not writing on a specific craft, but more on the process of imagination. The following photos show four projects I have been working on for awhile. Sometimes I buy “possibilities” and let them sit until I know what to do with them. The first photo is one of those weights you would wear around your ankles while working out. 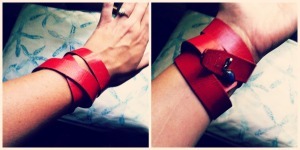 I think it will make a great cuff, but I haven’t worked with leather much and can’t get it quite right. The 2nd is some material I found at Michaels for $1.99. 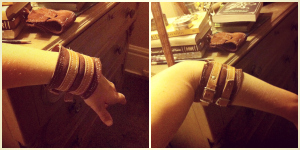 I mean I could just wrap it around my wrist, tie it off, and call it a day, but i think it wants something grander. The third is some beads that will make a great yoga bracelet if I could figure out what material to string it on. And lastly, I have some fabric and vintage ribbon screaming for a life as a cuff. But none of them are perfect in my mind. Sometimes you have to sit and let it evolve into what it is supposed to become. They need to speak to me more and so I am letting them take the weekend to marinate into a complete idea. I guess that’s patience, isn’t it? We want the beauty now, but sometimes we need to sit in the ugly before it becomes a treasure. So this weekend I’m waiting. You can’t rush inspiration, nor creativity. I guess that’s why art is called a process. I was a little homesick today. And by a little, I mean a lot. 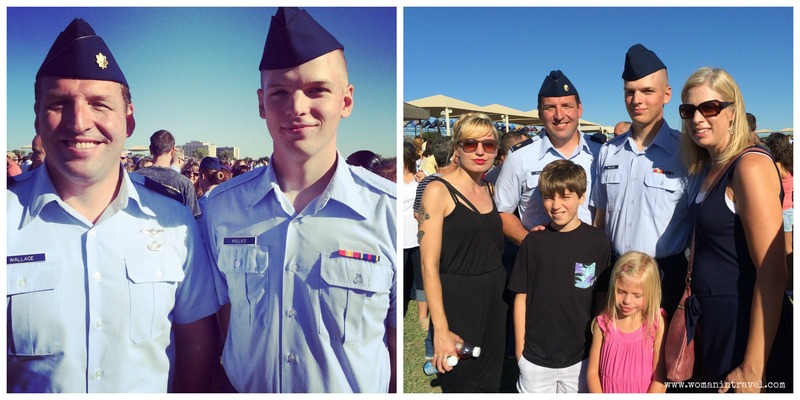 My 18-year-old nephew graduated from Air Force Basic Training today and all the family was there to celebrate him. All the family, but me. I thought it was a little too soon to ask the new job for some days off. Even in my sadness, my pride for my nephew and his accomplishment out weighed any morose thought. And because I am such a proud Auntie, here’s some photos of the graduate and his family. Sometimes when I miss my family, I bring out a box of jewelry that I’ve never worn, but means the most to me. You have one of those boxes, right? My grandmother Ruth loved costume jewelry and in the 50’s traveled around the world and collected some great pieces. Ruth never had her ears pierced, so I’ve never been able to wear her earrings. But tonight, rolling the bracelets through my fingers and draping the ornate necklaces around my neck, I found a pair of earrings that I thought would be easy enough to transform into earrings I can wear and cherish. 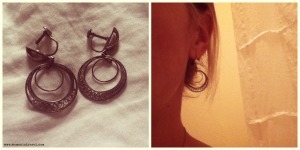 The earrings I chose are filigree and delicate. 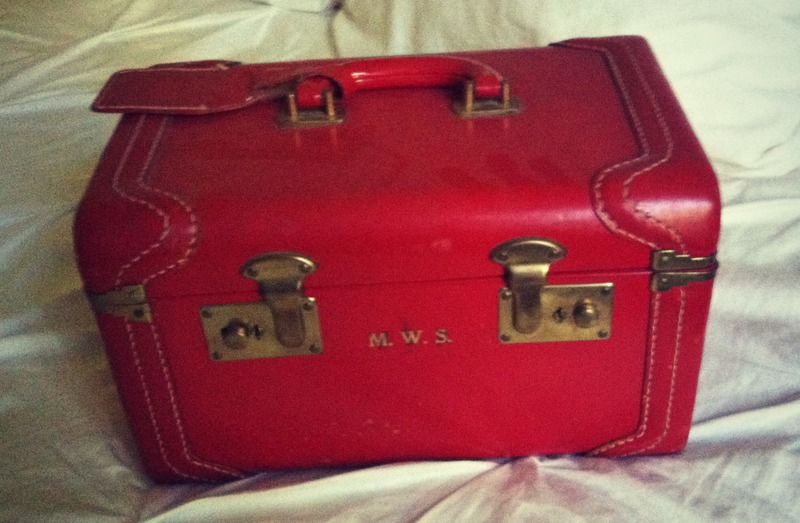 They’ll need to be shined up, but they’re the perfect piece of my grandmother I can take with me in my every day life. To transform them, I simply opened up the clip that held the clip-ons (using my trusty needle nose pliers), slid some fishhooks in their place, and closed the original clip back up. And with that, the earrings that have been sitting in the treasure box for twenty years, now adorn my ears. Grandma had some great style! 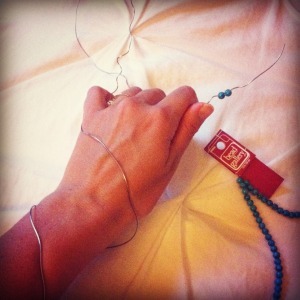 So yesterday I started this 31 day challenge under the topic of DIY Jewelry Making. As I am honing what I really want to do, and what compels me to write and be creative, I realize that more specifically, my 31 day challenge is about repurposed items turned into jewelry. I’m not a great step-by-step writer; these pieces of jewelry are made more to inspire, not necessarily always duplicate. Now I know the word “repurpose” is used pretty often lately. For me, it means seeing value in something that has been discarded and finding a new purpose for it. It’s fun looking at things in a way they weren’t necessarily designed for. It’s giving something a new life, and more importantly, finding beauty in it. Yes, I took a strip of leather from this vintage traveler’s case that I picked up at a ranch sale for a buck! Look at that monogram! Fabulous. So I get a cuff, a traveler’s suitcase that I relined with some funky, Asian fabric, and still thinking of what project to do with the broken glass that was a mirror originally inside. I wrapped it around and stitched a clasp to the end (leaving a little leather out at the end). 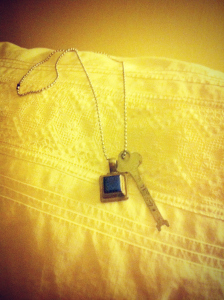 Then to add a little dimension, I sewed a necklace charm with a lapis stone near the clasp. 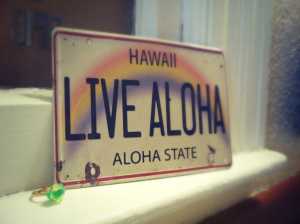 You see, my friend bought this charm for me while we were traveling through Costa Rica oh, like, 100 years ago. I have always loved it, but have never worn it because I wear a simple turquoise cross as a necklace that I haven’t changed out for 10 years. So now it gets displayed in a prominent, place of value, and it’s usually the component that is commented on the most in regards to the cuff. From suitcase to bracelet…let your imagination run wild.